ALL THE GOOD QUALITIES ever claimed for any ten pedals are combined to make this PERFECT LITTLE 18 OZ. BEAUTY. All the faults formerly found in pedals are eliminated. It is INSTANTLY attached to ANY SIZE bass drum. It is detached and packed up in THREE SECONDS. EVERYTHING is right under the foot from a DEAFENING CRASH to a most delicate PATROL APPROACH. It can be played from the FRONT or from EITHER SIDE. There is NOTHING to get OUT OF ORDER AND NO SPEED LIMIT. 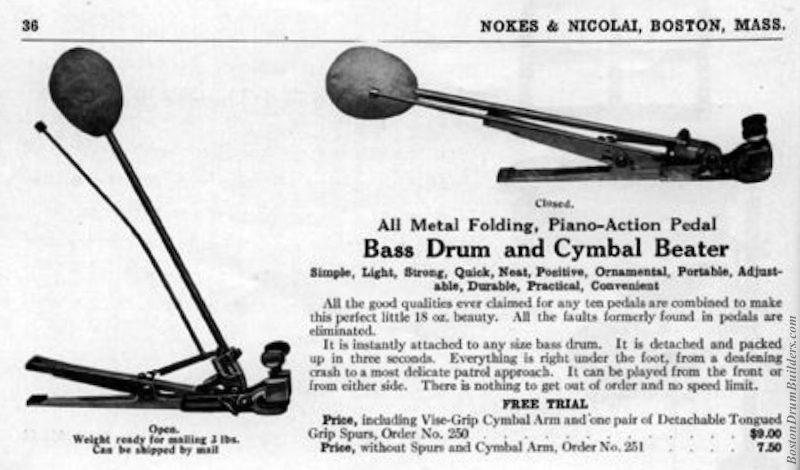 The same pedal is later advertised by Nokes & Nicolai as the "All Metal Folding, Piano-Action Pedal, Bass Drum and Cymbal Beater". There is no such pedal included in the 1907 F. E. Dodge Company Catalog so this design must have been introduced after 1907 but no later than about 1912 when Nokes & Nicolai took over the business from Dodge. 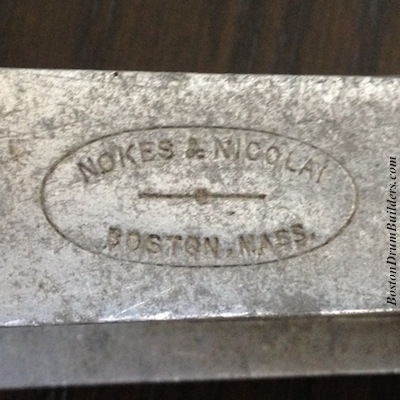 Early examples of the pedal are stamped with the Dodge name while later ones appear with the Nokes & Nicolai marking pictured below. Production of these pedals likely continued for the remainder of Nokes & Nicolai's existence until the company was sold in 1926. The first decade of the 1900s was a time of transition and innovation for Nokes & Nicolai's predecessor, F. E. Dodge. Wording appears stamped into many Dodge components of that era stating that patents were pending. Those designs include a hollow steel claw for drum hoops which housed a fully swiveling nut to receive the tension rod, a simple snare drum throw-off which allowed for the snare wires to be fully disengaged from the bottom head, and the metal bass drum pedal seen here. For whatever reason, none of these patents appear to have ever been granted as there is no record of them in patent databases. Also, later examples of each of these products appear with no patent wording at all whereas had the patents been granted, the applicable patent numbers would likely have been stamped into the parts. The most unique feature of Dodge's pedal is its ability to quickly fold down into a flat position allowing it to be stored and transported more easily. 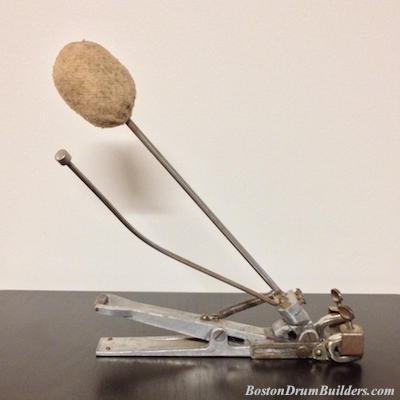 This would have been an especially desirable quality for theater drummers who were always on the move. 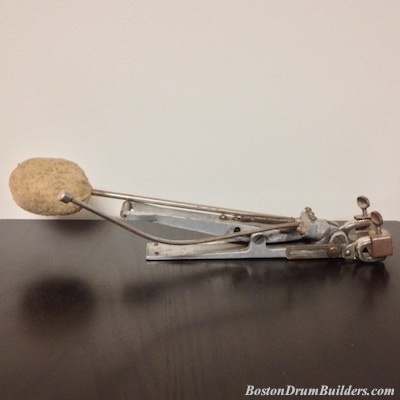 Do you have a percussion instrument manufactured by Nokes & Nicolai or F. E. Dodge? I want to hear from you! Send Lee an email at lee@vinson.net.